I had just enough time to dodge Vulpix’s fiery attack, and I turned to her. I heard Clary behind me. “Quick attack!” And I complied. Moving very swiftly toward Vulpix, I could see she was a bit disoriented as to where I was. I tackled her and she stumbled. Then I quickly made my way backwards, afraid that when she recovered, it would be only too easy to use ember on me and actually hit. When Vulpix recovered from the blow, she shook her head and Kyle shouted another demand. “Ember again, Vulpix!” She ran at me this time, and just as she passed, she used the move on me. Flames engulfed the grass around me and I jumped up in surprise. What was she trying to do? Kill me?? Then my eyes widened. She was!! Well, that was what battling was all about, wasn’t it. Then I thought back to that starly. No, I hadn’t killed it. I just knocked it out. Okay, but I didn’t want to be knocked out! I seriously prefer consciousness! So I Jumped out of the ring of fire that was closing in on me and I ran to Vulpix, knocking her off her feet. I turned around to Clary and she looked like she was pondering something. Then she shouted to me. “Use tackle now, Minun!” And I turned back to the wobbly Vulpix and tackled her. I moved closer to Vulpix, but Kyle picked her up and retrieved a pokeball from his bet. “Take a rest, Vul” And a red light came out of the pokeball and engulfed Vulpix, taking her inside. I shivered. If I had been knocked out, would Clary had made me go in my own pokeball? We walked back to where Clary was and then Kyle pulled another pokeball from his belt. This one had a little flame on it. “Here, sis. I told you that if you won, I’d give you a pokemon. Well, I’m keeping my promise.” He smiled. “I caught this one shortly after Vulpix.. but since I already had a fire type to train I figured you could have it. It’s not a very high level but I think it’s higher than Minun” He smiled down at me and I gawked at the pokeball. A red flash blinded me momentarily and then I rubbed my eyes. When I opened them, a pokemon was on the ground in front of me, smiling up at Kyle. He crouched down in front of it and motioned to Clary with his head. “Growlithe. Clary is your new owner now. Why don’t you say hi?” The Growlithe nodded and licked his face then turned to Clary. “Grow!” Hi! Clary crouched down too and pet the Growlithe. Then she turned to me. “Growlithe, meet Minun. She’s my pokemon.” The Growlithe turned to me and I approached them. “Mii” Hi Growlithe. Nice to meet you I Smiled. 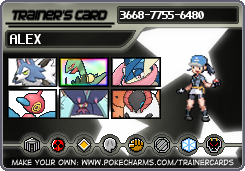 I liked the thought of having another pokemon around… even though Clarys turned out okay. “Mi..” Fine with me and I yawned. Growlithe and I settled ourselves on the grass and dozed for a bit.